American punk legends Green Day will still leave many Singapore rock fans scrambling for tickets for the band’s concert in Singapore in January. According to its official website, the concert will be held on Jan 14, 2010. 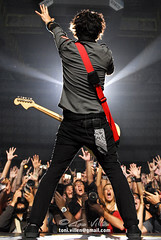 On the current tour, Green Day has been unleashing classics like Longview, Welcome to Paradise, American Idiot, Brain Stew right to new favourites Know Your Enemy and 21 Guns. Tickets will be available from all SISTIC outlets at S$128, S$88, S$128 and S$148. SISTIC fees apply. Public sales date is Oct 15. Hotline 65 6348 5555. Browse sistic.com.sg.